While Hurricane Harvey continues to add to the destruction it is leaving in its wake, many investors are wondering what is going on with oil. Many of the investors we’ve talked to have been surprised by the bearish reaction in oil prices. After all, if Harvey has disrupted the Eagle Ford shale oil fields in South Texas, shouldn’t that be pushing oil prices higher as supply goes offline? If that were the only consideration, the answer would be “Yes, the decline in production should be pushing oil prices higher.” However, thinking about supply is only half of the supply/demand equation. What about demand? Unfortunately for oil bulls, demand from refineries for crude oil has fallen off even further than supply (with more than 15% of U.S. refining capacity going offline in the wake of the storm), and nobody knows when refineries are going to come back online. This lack of demand has sent oil prices down to their lowest levels since late July (see Fig. 1). 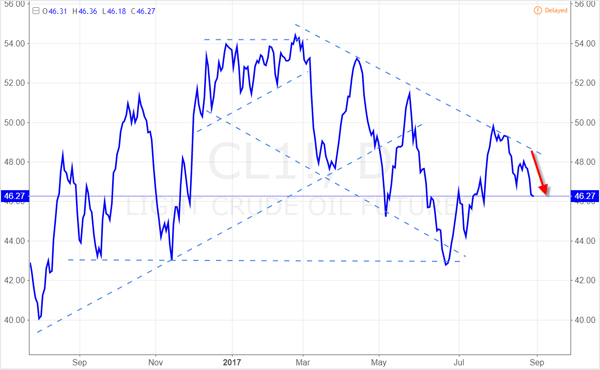 However, while the lack of demand from refiners has sent the price of crude oil lower, the lack of supply from refiners has sent gasoline prices to multi-year highs. 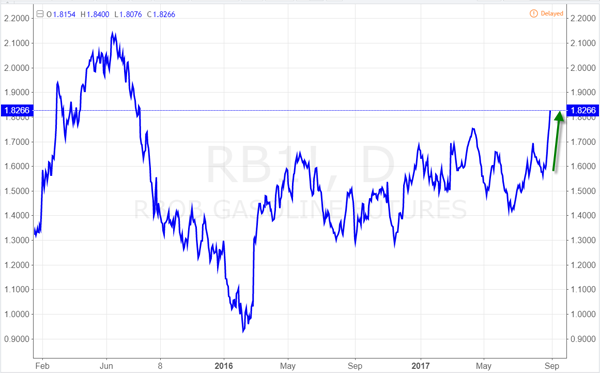 RBOB (reformulated blendstock for oxygenate blending) gasoline futures prices haven’t been this high since July 2015 (see Fig. 2). 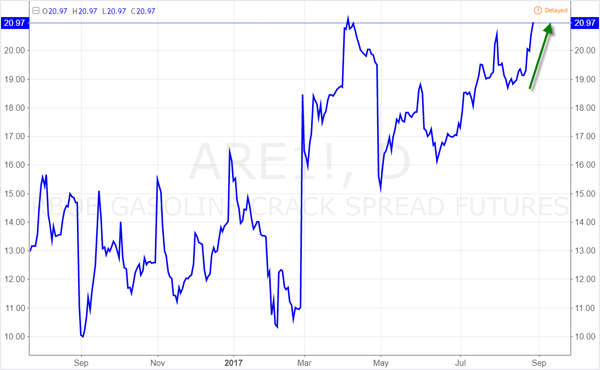 This divergence in prices between crude oil and gasoline has sent the crack spread — the difference between crude oil and gasoline prices — back up to its early April highs (see Fig. 3). This trend is likely to continue while refineries remain closed as Harvey keeps dumping rain on the region. Once the rain stops and refineries start to come back online, you will likely see an increase in demand for crude oil occur before you see an increase in the supply of gasoline. However, as crude oil inventories continue to build up on ships stuck in the Gulf of Mexico with nowhere to offload their cargo, it may take a while before the oil industry gets back to normal. Until we know the extent of the damage from Hurricane Harvey, watch for the crack spread to keep widening. Article printed from InvestorPlace Media, https://investorplace.com/2017/09/what-to-expect-from-oil-gas-after-hurricane-harvey/.